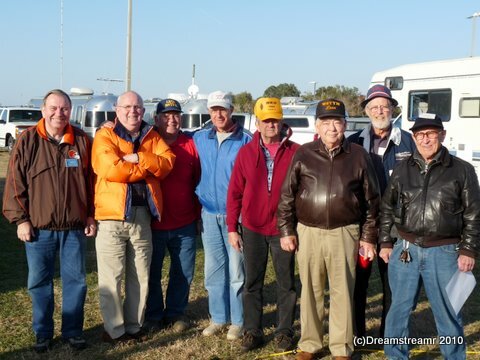 We spent last week at Orlando Amateur Radio Club’s annual hamfest, Hamcation. Our third year attending, we knew the ropes and easily relaxed into the experience. 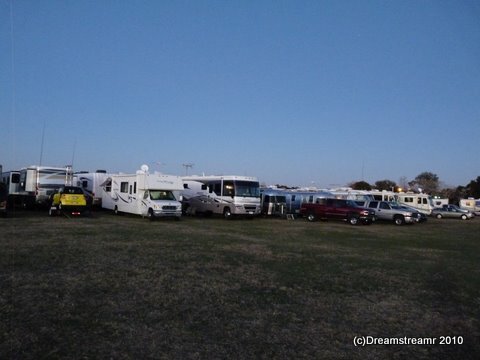 We didn’t know there would be record attendance by our group, the RV Service Net hams. The past couple of years RV Service Net has had around 25 to 30 RVs attending this large hamfest. This year we had at least 49 rigs — wow! We arrived at the gates before 1130 hours on Wednesday two days before the hamfest would begin. And we were easily 100 back in the RVers queue. 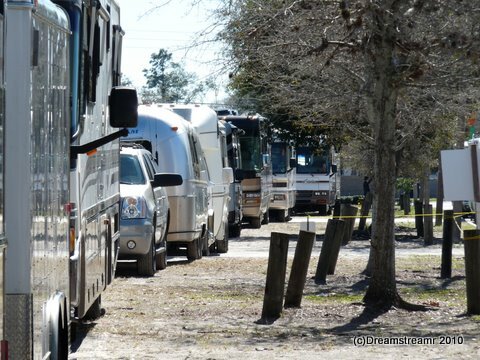 In front of us were many tailgaters or flea market sales folks as well as vendors who find RV travel perfect for managing their work at the shows. 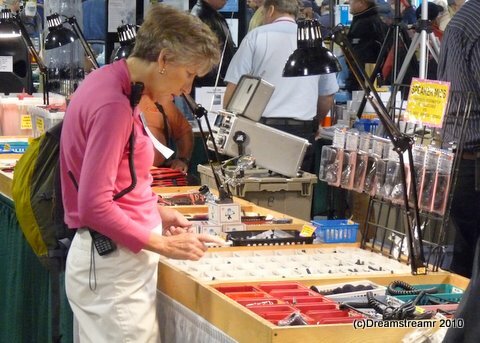 We sympathize with the vendors who move from hamfest to hamfest, displaying and showing their products for two or three days at each whistlestop. They can sleep in their own bed every night only if they are RVers, whereas the hotel/motel crowd are in a different room and bed every week or two. The gates opened on time and parking was handled smoothly and expertly by our group’s own AA8Q Jack Mitchell. Again this year the RV Service Net folks had RV parking at Lake Lawne’s edge, a pretty site within 300 yards of the indoor sales areas but out of the main flow of traffic. Our group had so many rigs parked we established our own small community. This year, our third, we were less the newcomers. We have met many of these hams in our previous two visits to Hamcation or at Hamvention in Dayton last year. Some we only have met on the air, talking on the RV Service Net’s daily 40 meter morning nets. It was nice to meet them in person and have face-to-face conversations with everyone. You might wonder, why were we there? One compelling reason is for Jim to represent the Club’s leadership, as upcoming President. He has spent the past two years learning the ropes as 2nd, and 1st VP, and this summer he may become President. One of the primary duties is attendance at Hamcation and at the WBCCI (Airstream owners association) annual rally. But an even better reason for attending Hamcation is because this is a really fun hamfest for us. 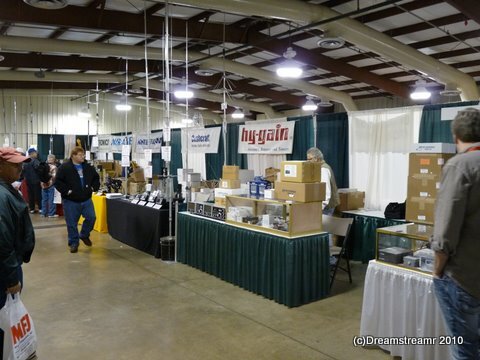 This is the largest hamfest in the southeast U.S. and enjoys a large number of new equipment vendors. There are typically over a hundred tailgaters outdoors selling a tremendous variety of gear, new and used, from their tables or trailers or tailgates. 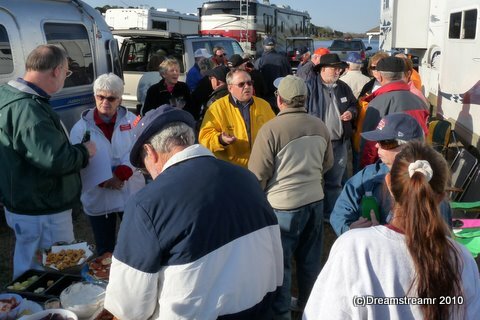 Best of all is the Orlando, Fl, weather and very enjoyable camaraderie of the RV Service Net’s members. This year we enjoyed the crowd a lot. The weather left a lot to be desired, it wasn’t warm at all. Cool weather seems hardly worth complaining about when every state in the Union was receiving snow. But heck, we’re in Florida and it’s supposed to be warm and sunny. It was cold and rainy all day Friday until sunset. Really cold and rainy. Friday was the opening day of the hamfest so a lot of us braved the rain and were in the buildings when the clouds just burst and poured down the rain. Stuck inside with our credit cards and all these great vendors selling ham radio gear and accessories. Darn, what are we going to do now? We made the best of it, of course. The vendors give away waterproof shopping bags, so we won’t need to worry with keeping our purchases dry. Our goal for the opening day, though, was scoping out which vendors were present and what parts of their product line they brought. They cannot bring everything to every show, so we browse and scheme what we’ll do without and what we need to buy. This decision process is crucial, a real challenge for us. Hamcation represents our one golden opportunity for the year to stimulate the economy and supply our electronics gear needs for the next year. Or at least until the next hamfest. Jim will have to make do awhile with whatever he can secure while we’re here. He stocks up on wire and connectors of several sizes, coax cable and ends, various small fittings for the radios or antennae, and sometimes solder, tape, and even rivets. We take the most time poring over the variety of new radios, antennae, software, and amplifiers. This isn’t just for the vendors’ benefit, but is how we learn about so much of the equipment. We can look at pictures and read descriptions all year long. We can sometimes find a amateur radio store but not often. The hamfest gives us a great opportunity to browse, touch the gear, ask questions about this feature or that, and try to assimilate all this information into a shape we can remember. We have enough amateur radio gear for our rolling house and our truck. We have long distance and middle distance and short range capabilities on the ham bands. We have a very nifty antenna mounted atop the Airstream that folds down electrically for travel or to avoid lightning or falling limbs. We have good antennae to allow one of us in the truck to call the other in the trailer when we are anywhere from a block away to up to 50 miles separated. What else do we need? Well, it’s not so much need, is it? Do you need jewelry? Do you need a good looking truck? Of course not, it’s more about necessity! You may have heard before, “When all else fails, Ham Radio works”. This is more than a slogan, it represents a truth demonstrated many times every year across the continent. We are just a small couple of cogs in this wide network of ham radio operators who may, some day, provide essential relaying of communications into or out of an area stricken with loss of normal communications. So it’s our duty to keep on buying really cool radio gear and learning how to use it so we can help you. You see, it’s not really about us at all, it’s all about serving you. Wow, I’m getting into this, I think I should take a break and go browse a ham radio equipment catalog and see how much more I can help you. I guess I was getting a little sidetracked. Where was I? Oh yeah, the reason we go to hamfests. 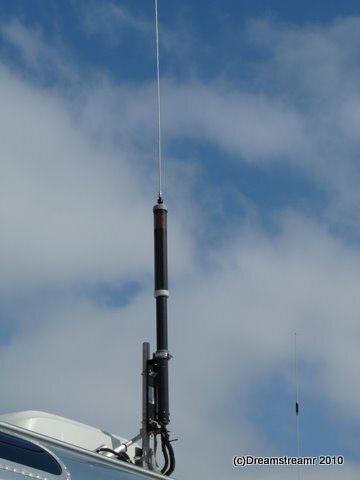 We check the new radios and antennas and think, “When we have a much bigger house (than our current 188 square feet) we could get this radio and that amplifier and this power supply and rig it to this really tall antenna on a huge tower and . . . 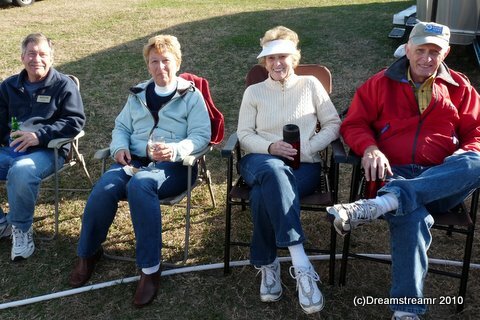 But the best reason to attend the hamfest with the RV Service Net is the RV Service Net people. From anywhere we set up in North America we can reach friends on the RV Service Net at scheduled ham radio nets any day of the week. The daily nets are directed by volunteer net controllers from all over the U.S. and Canada. And a special treat for us was to meet so many of the net controllers face to face last week. We talk to these folks We enjoy visiting with them, talking with them, eating with them and, with many of them, traveling too. RV Service Net is a one of many many great groups of ham radio operators. We enjoy being able to reach one of our group’s nets from almost anywhere on the continent. And it is especially neat to spend the week in Orlando with so many hams from this group. You probably wonder what we purchased at this Hamcation? Jim bought wire, microswitches, grounding strap, and we bought a couple of microphones. Is this not a wonderful demonstration of our unselfish quest to better serve you in any communications failures? We’re making a little fun about what is really a very serious matter. For all the enjoyment we have, Jim especially, with ham radio the premise for the amateur radio licensing system is to promote advancement of emergency communications capability. And we do take this seriously and continue to carefully hone our skills and equipment for best radio communications. This entry was posted in amateur radio, Full-timing and tagged antenna, ham radio, ham station, Hamcation, Hamfest, High Sierra Pro, Orlando Amateur Radio Club, RV Service Net, Tarheel Antenna Lift and Lay mount. Bookmark the permalink. You may already know that the state of Idaho has shown its amateur radio operators gratitude since the Teton Dam break and wash-out in 1976. We get deeply discounted rates on our vehicle special plates. Amateur Radio has carried the needed communications for mass comm failures like the 1976 Teton Dam break, the massive La Jolla communications failures last year or the year before, Hurricane Katrina, California’s wildfires (pick a year) and others. 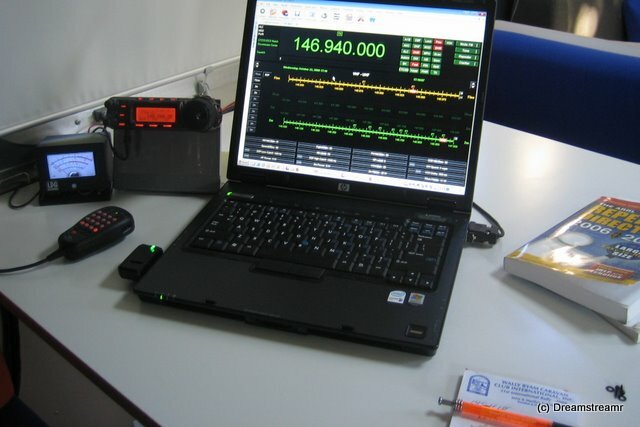 Amateur Radio provides primary communication for countless small group and individual rescues every year. Amateur Radio for many years provided humanitarian communication between overseas servicemen and their families, my first exposure to amateur radio back in the 60’s as a military dependent. We get a small break, I think, on our NC license plate, I think. And it’s really easy to answer when the campground asks for the trailer’s license plate number — N5RTG. Pretty cool, yeah. Now if I can just talk Debbie into using her call sign, N4RTG, on the truck. Great to hear from you. I was worried that you may have buried up in the sand down there and started hibernation! Barry, Hibernation yes. Windy, cool, and staying up so late watching Australian Open then Olympics into the wee hours. Neighbors don’t even think we live here — seems like we venture out so seldom somedays. We told them they need to put tennis courts here, then they’d see us 2X/day. We haven’t been to the beach but once, though. Darned weather just hasn’t been all that warm yet. Hey, you guys sold the business — isn’t it about time you found your way down here? Bring us some of that great West Ky weather? Come see us!